Baroness Kate Parminter, our president, has received a Parliamentarian of the Year award, as reported in today’s West Sussex County Times. She has been presented with the Green Ribbon Award for ‘consistently challenging for the environment both inside and outside the House’. 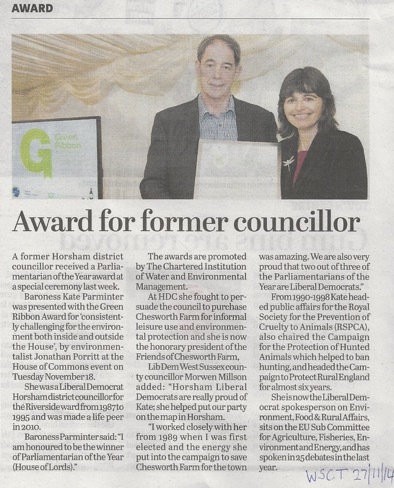 In the local paper, Lib Dem West Sussex county councillor Morwen Millson gives tribute and outlines Kate’s past and present links with Chesworth Farm. As a Lib Dem district councillor, Kate was instrumental in persuading HDC to purchase the farm for informal leisure use in 1991. So yet more positive news for the farm and for the Friends. Find the article on page 32 of the 27 November edition.